NOTE: The recommended way to deploy your application is to use the official deployment tool (windeployqt). Try that first! Continue reading this guide only if windeployqt doesn't quite work for you. Sometimes, your app might be missing some functionality after deployment. Perhaps a window is blank, an image doesn't show, or a music file won't play. If this happens, windeployqt has probably forgotten to include a file that is only loaded at runtime (like a plug-in DLL). Rename C:\Qt\ to C:\QtHidden\ (This turns your PC into a clean environment, just like one that doesn't have Qt installed). If your app worked correctly, congratulations! You are almost ready for deployment. You don't want to ship a 1.5GB package though, so it's time to clean up unused files. Do the deletion steps below in C:\Deployment\ and all of its subdirectories. After each deletion, launch C:\Deployment\MyApp.exe and test it. If it stops working, restore the files you just deleted. Launch MyApp.exe. While it is running, try to delete all DLLs. The DLLs that aren't used will go to the recycle bin, leaving behind only the DLLs that you need. (This trick doesn't work for .qml and qmldir files, however). 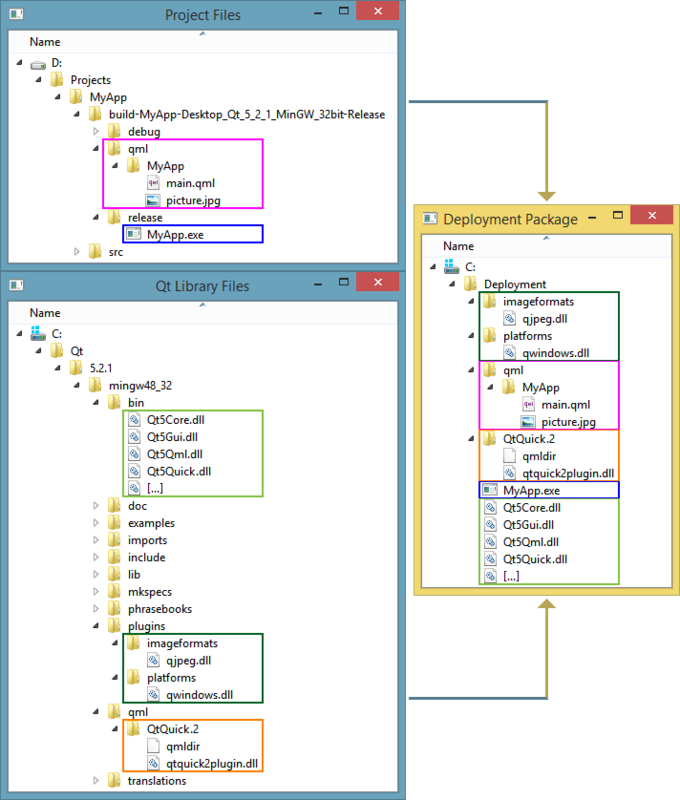 (If you used QML) Delete a few .qml files and try relaunching MyApp.exe. Repeat until you try all .qml files. Rename C:\QtHidden\ back to C:\Qt\ to restore your installation. Say that you followed this guide. Say which attempts passed, and which attempts failed. Describe how it fails, and provide any error messages that you see. Remember: The more info you provide, the better your chances of getting a solution! This page was last modified on 18 August 2018, at 12:49.